NISM have been building both skibikes and skibike components for the last 15 years and have taken the bold step of producing purpose made skis suitable for ski biking for the 2012-13 season. "No re-purposed ski blades here...these were made to run in line with each other instead of parallel" claims the NISM website. What sets the new NISM Snow Bike Skis apart from normal skiboards is that they are asymmetrical, i.e. the tip is significantly wider than the tail. By using a front ski in the normal orientation and the rear ski back to front, you can create a shared sidecut profile between the front and back skis. This system enables both skis to work together as a single ski, claimed to give far better control and stability than any other system. Furthermore the NISM Snow Bike Skis feature a rockered base option to give quicker edge to edge response and a much larger sidecut radius than most skis of this length. The mounting hole pattern will work with most standard 40x40 and 50x100 mounts, used on the more well known skibikes. A robust construction is promised, intended to survive the hard landings and head on impacts known the break other brands. NISM Snow Bike Skis are available for pre-order the first 25 customers will receive $100 off the regular price of $450 and a set have already been earmarked for extreme free style skibiker Raymond Georgsson, I know he will see that they are used to the limit of their performance envelope. "Lies, damned lies, and statistics" is a quotation often attributed to Benjamin Disraeli, the 19th century British Prime Minister. The source for this view is the autobiography of Mark Twain, where he makes that attribution. The phrase is often used to describe the persuasive power of numbers, particularly the use of statistics to bolster weak arguments. That aside, Randy Kimball from the American SkiBike Association released some interesting statistics this week, based upon their membership. If you are struggling to persuade your local ski resort to open access to skibikes, challenge predjudice or change the view that all skibikers are "Hell's Angels on skis", you may care to share these statistics with them. 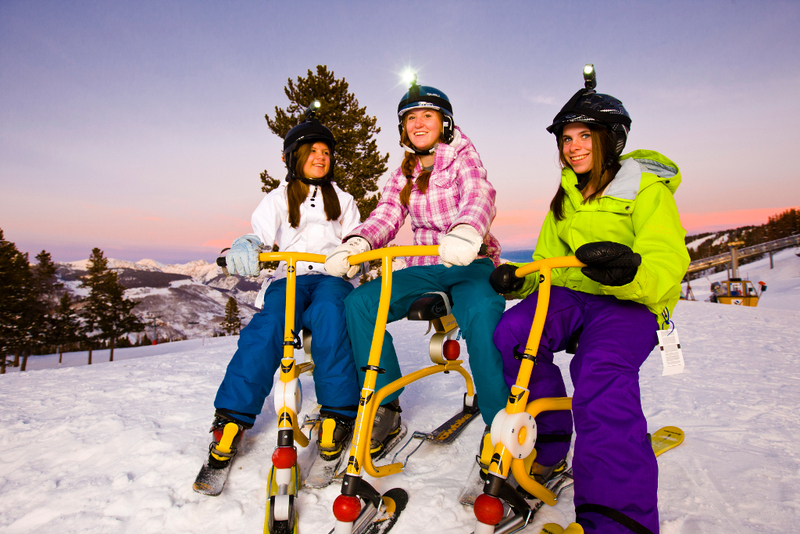 News just in from Devin Lenz, founder of Lenz Sport SkiBikes, Vail Colorado will grant access to skibikes in the forthcoming 2012/13 ski season. Not only is Vail a premier ski resort, Vail Resorts also own; Beaver Creek, Breckenridge, Keystone and Heavenly, Northstar and Kirkwood. Does this mean that skibiking has become respectable or is it just a cynical ploy to boost ticket sales in a faltering economy? 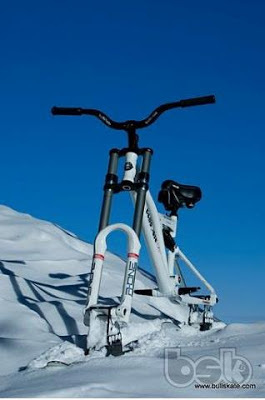 For the moment, who cares, it's time to get your skibikes out there and have some fun this season. When one thinks about the legendary ski resorts around the world, a number immediately spring to mind. Vail is definitely one of those. Resorts don’t reach legendary status without good reason. Vail has it all - massive and varied terrain, a huge modern and efficient lift system, great vertical, tons of snow, classic après, vibrant nightlife and a booming “village” (err...town, um....city) with all the services one would expect from a mega resort. Vail is the quintessential world class ski resort that many others try to imitate. BullSkate freestyle snowbikes have announced second hand skibikes for sale at knockout prices prior to the 2012-13 ski season. The offer is a skibike for just $990 (£618 or €771- at current exchange rates). 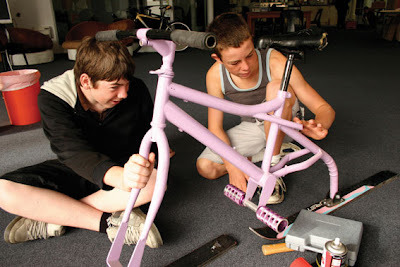 The frame is handmade in Taiwan, is powder coated and has an advanced downhill geometry. The rear damper includes rebound adjustment and allows for 154mm travel. For the front suspension we decided on the RST R1 double bridge downhill fork with 180mm of travel. With these two components the rider is assured of a comfortable and safe ride in any conditions while standing or seated and is able to rip in the park and absorb most obstacles on the slopes. I rode BullSkate SnowBikes in early 2012 and found them to be a strong, plush and stable ride, well suited to both on and off piste riding. They would be of particular interest to any skibiker wanting to perform freestyle jumps and tricks or head into rougher, back mountain type terrain. The only downside of the design, is that they are quite weighty, which might put off smaller, lighter or less physical riders. If you are tempted, don't delay, the sale ends soon.